Authors: Ivanov А.А., Abrosimova A.N., Bulinina Т.М. Aim: to investigate the effect of the vaccine "Grippol" on radioresistance with respect to proton irradiation. Material and methods. The effect of the vaccine "Grippol" the survival of the animals was studied in mice CBAxC57BI F1, which was immunized for 10 days prior to proton irradiation. Results. It is shown that proton irradiation causes the death of the animals at all doses tested: 9% at a dose of 7.0 Gy; 10% — 8.0 Gy and 33% after irradiation at a dose of 8.5 Gy, at the same time the survival rate after pre vaccination study groups was 100%. It seems appropriate to further study the impact of the vaccine "Grippol" at low doses of proton irradiation using appropriate test evaluation of hematological, im-munological, genetic, physiological and other factors. Conclusion. The vaccine "Grippol" introduction into mice before lethal proton irradiation increases survival of protected animals. All articles of the authors: Abrosimova A.N. , Bulynina T.M. , Ivanov A.A. Authors: Dorozhkina O.V., Bulynina Т.М., Ivanov А.А.. Aim: to examine the effect of individual and group housing of mice on radioresistance. Material and methods. Effects of individual and group housing of mice on immunity and blood systems were studied on ICR (CD-1) and C57BI6 male mice before and after proton irradiation. Results. Group housing of intact animals resulted in a decline in the number of nucleated cells in the femur bone marrow and thymus mass. The irradiation with proton with energy of 171 MeV at a dose of 1 Gy causes a statistically significant greater reduction of the number of nucleated cells in the femur bone marrow in group-housed mice. A trend toward greater safety of the number of leukocytes in the peripheral blood and higher proliferative activity of bone marrow cells, as well as lower level of aberrant mitoses have been noted in individually-housed mice. Reduction processes in the recovery period of radiation sickness take place at a greater rate in group-housed mice. Conclusion. Group housing of male mice causes increased sensitivity of the blood and immunity systems to the effects of radiation and at the same time accelerates processes of radiation recovery. All articles of the authors: Bulynina T.M. , Ivanov A.A. 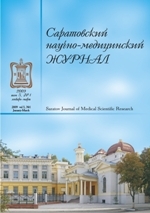 Authors: Galstyan I.A., Nadejina N.M., Suvorova L.A., Kashirina O.G., Nugis V.Ju. Aim: to study the long-term effects of acute radiation syndrome (ARS), developed at the victims of the Chernobyl accident. Material and Methods. 237 people were exposed during the accident, 134 of them were diagnosed with ARS. Dynamic observation implies a thorough annual examination in a hospital. Results. In the first 1.5-2 years after the ARS mean group indices of peripheral blood have returned to normal. However, many patients had transient expressed moderate cytopenias. Granulocytopenia, thrombocytopenia, lymphopenia and erythropenia were the most frequently observed things during the first 5 years after the accident. After 5 years their occurences lowered. In 11 patients the radiation cataract was detected. A threshold dose for its development is a dose of 3.2 Gy Long-term effects of local radiation lesions (LRL) range from mild skin figure smoothing to a distinct fibrous scarring, contractures, persistently recurrent late radiation ulcers. During all years of observation we found 8 solid tumors, including 2 thyroid cancers. 5 hematologic diseases were found. During 29 years 26 ARS survivors died of various causes. Conclusion. The health of ones with long-term ARS effects is determined by the evolution of the LRL effects on skin, radiation cataracts, hema-tological diseases and the accession of of various somatic diseases, not caused by radiation. All articles of the authors: Galstyan I.A. , Kashirina O.G. , Nadejina N.M. , Nugis V.Yu. , Suvorova L.A. Authors: Samoilov A.S., Shandala N.K., Korenkov I.P., Romanov V.V., Filonova A.A., Novikova N.Ya. health indicators of the public living around the NPP, general state of the adult and children public is healthy. There is no impact of the NPP on negative trends in some changing indicators of the adult and children public health. All articles of the authors: Filonova A.A. , Korenkov I.P. , Novikova N.Ya. , Romanov V.V. , Samoilov A.S. , Shandala N.K.